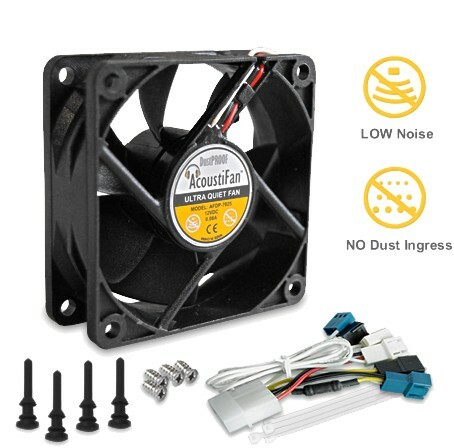 For minimum possible noise, please consider using this fan with a 70mm AcoustiFan Gasket to dampen any remaining noise and vibration. I bought this fan to replace the fan on the stock AMD CPU cooler for my Athlon x4 640. The AMD PWM controlled fan was efficient but irritatingly noisy under load. The DustPROOF fan runs on full speed all the time and keeps the max temperature steady on 59 degrees Celsius under full load, over many hours. So the air flow is not as good as the AMD fan, but sufficient. Even at full speed, this fan makes about the same noise as the AMD PWM fan at its 2-3 lowest RPM levels. The only downside is that the fan is not PWM controlled. The noise from my PC is now dominated by the PSU fan, while this CPU fan is slightly more noisy than the two ACE Frost pro cabinet fans, mostly because the sound is a bit higher in the frequency spectra. All in all a great fan for an acceptable price. On lower RPM this fan is very quiet.